It is still November 2018, the centenary of the end of World War I (1914-1918). Back in 2014, I wrote a brief post saying that one of my great-grandfather's had a "piece" of that war; in fact, all of them had at least some piece of the era, as young men in the 1910s. Specifically and concretely, each of my four great-grandfathers had to register for the draft (conscription) in 1917-1918. I have located all four their draft registration cards and will post the originals and transcribe them below, followed by some comments/thoughts on each of their individual cases and circumstances in 1917, and some informed conjecture on what they may have thought of the war. In May 1917, the USA was on the way to raising a multi-million-man army which was to reach a size of 4.35 million when all was said and done, up from a meager peacetime strength of one-hundred-some thousand (1916). As soon as your case is finally disposed of, the adjutant general of your State will notify you by mail that you have been selected for military service. Your local boards will post a list of all persons selected for military service in a place at the office of the local boards accessible to public view. The local board will also give lists of persons selected for military service to the press with requests for publication. The notice to report for military service will come when the Government is ready to receive you. 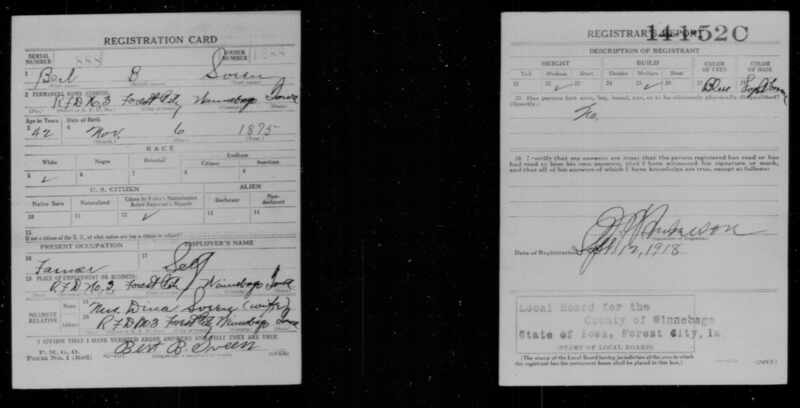 Here are my four great-grandfathers' draft registration cards. Only one of the four was actually drafted, and it might not be hard to guess which one, given the information on the cards. "I affirm that I have verified above answers and that they are true,"
Home Address: 202 Hartford Ave., New Britain, Conn.
Where employed? Pearl St., Hartford, Conn.
Home Address: 69 Church St., New Britain, Conn.
Father's Birthplace: North Hero, Vt.
Place of Employment: New Britain, Conn. Address of nearest relative: East Berlin, Conn.
A middle-aged Earle Hazen (right), on his daughter's wedding day, 24 years after he appeared before the draft board. I believe that is a stout-looking Walter Kosswig (no jacket) grinning and loitering in the background. The older woman is Earle's wife Catharine. The bride and groom are my mother's parents. The yellow-paper handwritten caption is the work of my great aunt Ethel (Kosswig) Hinchliffe, who put together an anniversary scrapbook in 1982. 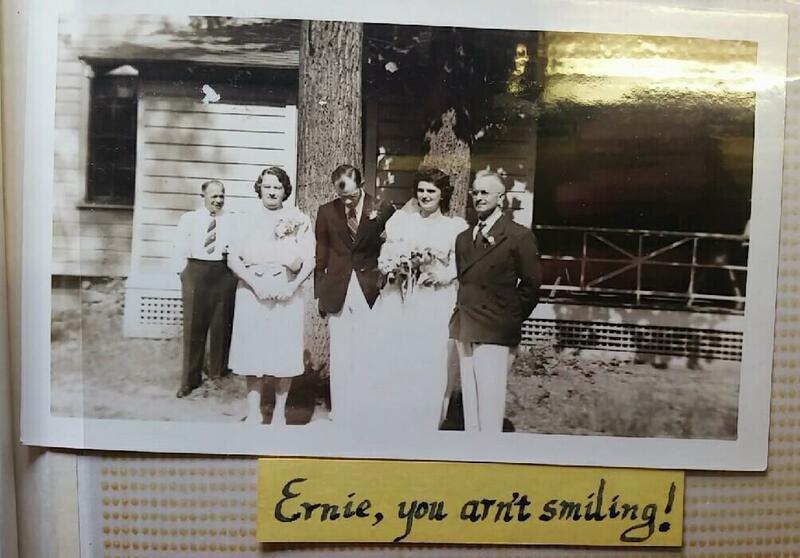 "Ernie" refers to my grandfather, who is looking down. These draft-registration cards offer little portraits of each man as he was a century ago (as of this writing). Some comments on how it turned out for each of the four (my four great-grandfathers). While I never knew any of them, I think I can re-create a lot of what they were like from second-hand,] information and through impressions of their children (my grandparents) and other relatives. I can offer up conjecture on why things turned out as they did. Some questions I cannot answer and will pose them openly. Peter C. J---- [1893-1979] was not drafted. Peter C. was of prime age but had a strong exemption: "Registrants employed in agricultural labor," and a lesser exemption: "Married registrants with dependent spouse." He had no children yet in 1917, but my grandfather was born the next year. Though Peter C. was not drafted, I recall my grandfather saying that his father (i.e., Peter C.) had a cousin of the same first and last name, and of the same approximate age, with the only way to tell them apart being their differing middle initials (the cousin Peter S.). Peter S. was drafted but Peter C. was not. One might be tempted to imagine a case of same-name mistaken identity letting my great-grandfather off the hook: [Draft Board official on selection day:] "Okay, next one. Oh, that name again? We already took him this morning; Say, who's in charge here, anyway? Who allowed the same name to come up twice? Shred that duplicate card, please. Next name, and no more duplicates!" This improbable situation is made impossible by the fact that Peter C. and Peter S. were in different states at the time (Colorado and Iowa, respectively). An Iowan for about 95% of his life, in 1917 Peter C. happened to be in Colorado. He had gotten married in Colorado on May 10, 1917, less than a month before appearing before the draft board on June 5, 1917. It seems to me more than coincidental that he came to get married right between the declaration of war (April 6) and the day all age-eligible men ages 21 to 30 were to appear at the draft registration offices (June 5). I speculate that the declaration of war must have greatly sped up the process, of marriage that is. 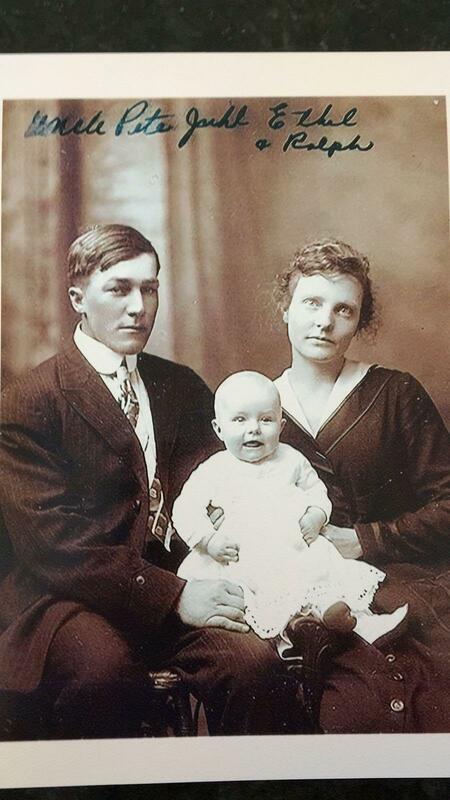 Peter's wife was born Ethel Erickson (1892-1986), in Nebraska, to Swedish parents who had arrived about 1880. I have heard that she was a telephone switchboard operator when telephones first started taking off in the 1910s. As of May 1910, she was still in Lancaster Co., Nebraska, where the census-taker records her as attending school at that time (impressive, because she was then about to turn 18, and this was 1910 in rural Nebraska). Seven years later, May 1917, she gets married in Colorado. Neither Peter C. nor Ethel had any pre-existing connection that I can figure out with Colorado; both end up there in their early 20s chasing opportunity, Peter C. of a free land offer and Ethel (apparently) in the booming telephone switchboard operator trade. How they met, I cannot guess. 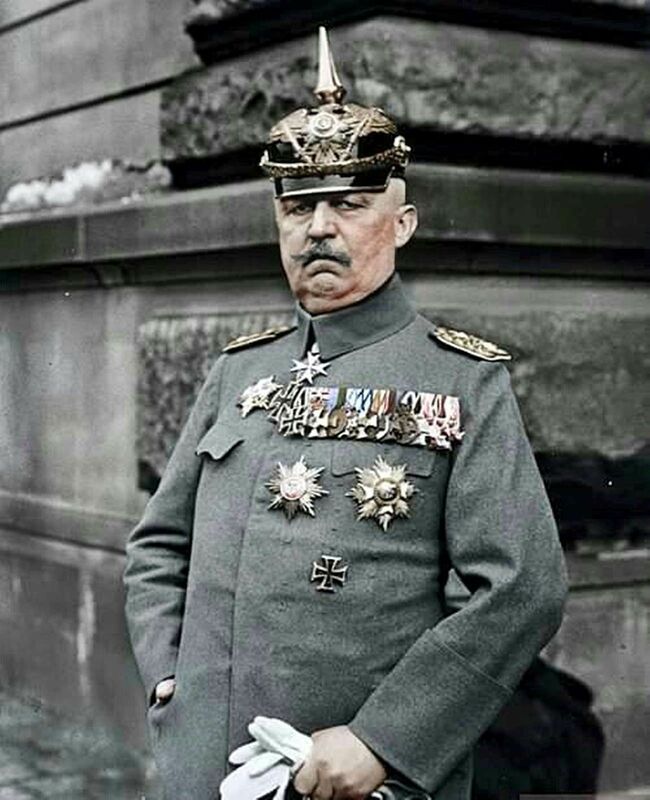 How would Peter C. have felt about the 1914-1918 war in general? I can only try to reconstruct his views as follows: It is said that Midwestern farmers were against the war, so there is that as a baseline. There is something more in Peter C.'s case, though. He was of Danish recent ancestral origin, and not a run-of-the-mill Dane as both parents came from the region of South Jutland which was under German rule from 1864-1919. The political status of that province (i..e, detached from Denmark) was probably a main factor behind Peter C.'s father [1867-1948]'s emigration to the USA in 1887: He would have otherwise been subject to conscription into the German Army for several years; Peter C.'s father was born a Prussian subject and by age 3 was a subject of the German Empire, through no choice of theirs. Peter C. heard stories about German conscription-enforcement officers raiding the house in South Jutland in about the mid 1880s, appearing at the front door to look for his father's two older brothers, wanted for draft evasion. They slipped out the back door as the MPs came in the front. This kind of family story might have inclined Peter C. to at least some sympathy for the war-intervention voices, but I cannot imagine he was anything much beyond neutral given the general anti-war feeling of his class: Midwestern, farmer, Lutheran. You may be surprised to learn that there is no such place. A search for Osgood, Colorado, comes up empty on Google Maps, for one thing. Nothing online comes up for Osgood, Colorado. What's this about? Bert B. Sveen [1875-1966] was not drafted. According to my uncle's research, Bert's birth name in Norway was Børre B. Sveen; I think he exclusively used "Bert" in the USA, which was his home from age 7 or so in the early 1880s. The "B." middle initial in Borre B. Sveen was the patronymic Børreson, as his father [1832-1924] was also named Børre. 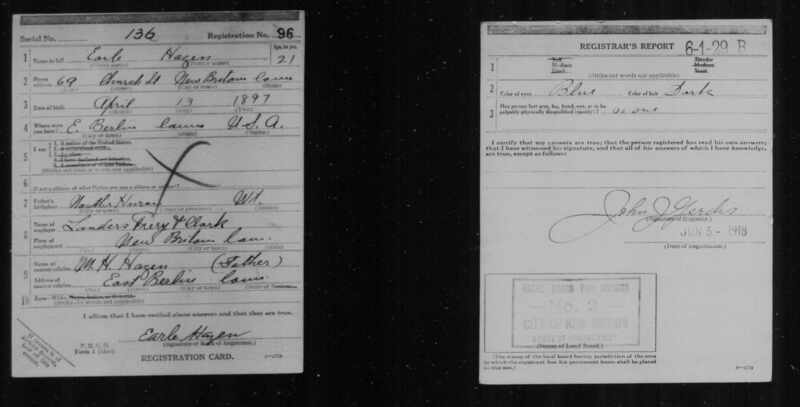 Many/most of his U.S. descendants and other Sveens use "Swain" instead of Sveen, but I notice Bert himself used Sveen on his own draft-registration card. The June 1917 wave called in men ages 21 to 30: Bert being over 40 was not among them. In 1918, it was decided to expand the registration process to men ages 18 to 45, which then included Bert. He would never have been high on the priority list due to his status as a farmer, his having dependents (including my grandmother), and his age. 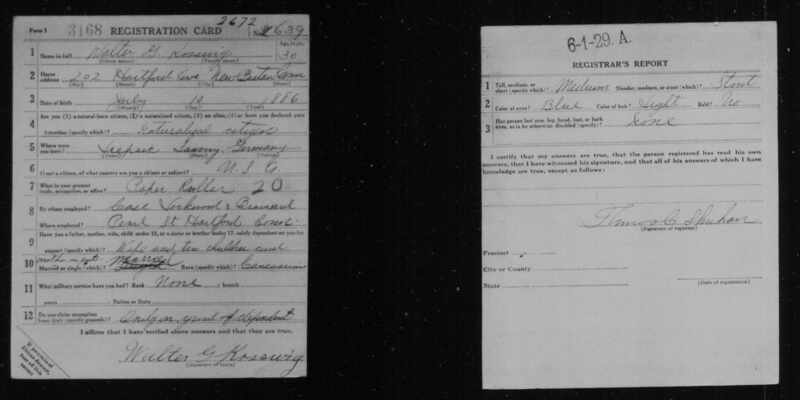 And though this didn't matter to the draft board, I would note that his wife Dina (or Dena) [1880-1947], whom he names on his registration card as his closest relative, I understand was not much of an English speaker, having arrived in the USA as a young adult circa the turn of the 20th century. Bert and his wife both had ancestral origins in the Hedmark region of interior Norway, but Bert was a U.S. resident for over 90% of his life. I do not know how the Sveens would have felt about the prospect of war against Germany during the controversy over intervention from mid 1914 to early 1917. I can say this: Of the 96 U.S. Senators in 1917, 82 voted 'Yes' on the war resolution in early April, and 14 did not (six voted 'No;' eight abstained); One of the six Senators who boldly voted 'No' was Asle Gronna (R-ND) who was of Norwegian ancestry. A wiki editor says: "Gronna...reflected the attitudes of his region -- progressive and isolationist." Another wiki editor says this, citing a 1988 book called The Great Silent Majority: Missouri's Resistance to World War I by a Christopher C. Gibbs: "Midwestern farmers generally opposed the war, especially those of German and Scandinavian descent. The Midwest became the stronghold of isolationism; other remote rural areas also saw no need for war." I cannot expect that Bert Sveen would have been a pro-intervention advocate or enthusiastic about the war. Walter G. Kosswig [1886-1952] was not drafted. In the nationwide call-up of June 5, he was just within the age range of eligible draftees, fixed at ages 21 to 30. Walter turned 31 a month later. I would say two things about Walter in 1917: One, the Kosswig family, of which he was a standard member, had a political tradition that would have been anti-war for several reasons, as I talk about in Post-366 (Book-as-Time-Capsule: My Great Uncle's "All Quiet on the Western Front"). Two, Walter could claim exemption for having two sons at the time, including my grandfather. Unlike the two men I mention above, he was not working in a critical occupation like farming. He was following his father's calling and working for a printing press; he lists his occupation as Paper Roller (what that means, I am not sure) at a Hartford printer, Case, Lockwood, & Brainard. He was also involved in some way in this capacity with the New Britain Record newspaper, New Britain being the Kosswigs' hometown in America following emigration from Leipzig in 1887. (I note that Walter [or the registrar, who may have filled out the form] spelled Leipzig as "Liepsic," which was then a common English spelling (see Leipsic, Ohio). The year 1917 was a bad year for Walter in that he suffered two near and dear losses: his father died early in the year, and later in the year he lost his hand in an printing machine accident. His stoic reaction to the loss of his hand earned him a favorable writeup in the paper the next day, the original clipping of which he proudly saved, and which was preserved by his son Ern, where I found it around the mid-2010s in a folder. His reaction was not panic or despair at the life-changing loss of his hand; rather, he patiently asked someone to inform his wife that he might not make it home on time for dinner. That leaves Earle Hazen [1897-1959], the youngest of my great-grandfathers. He was drafted, and served in the U.S. Army for a portion of the war. I wrote more about Earle Hazen four years ago in Post 224: My Great-Grandfather's Piece of World War I, including a picture of him from 1930. I have so far not found a picture of him from his late teens or early 20s as he would have appeared in 1918. I had assumed that he was drafted in 1917, but I learn from a close reading of this draft registration card that he was not even registered until June 5, 1918 (by which time, I might add, the last hopes for a German capture of Paris were beginning to fade, after some solid early-1918 successes including the separate peace with the new regime in Russia, on terms very favorable to Germany). The reason Earle missed the 1917 registration was that was 20 years old. He turned 20 within a week of the declaration of war (April 1917). The youngest age that was to be conscripted in the summer 1917 call-up had been set by policy at 21. He was a year too young. He could have volunteered in 1917, but did not; this is possibly a clue on his feeling about the war at the time. Ethnoculturally his people (colonial-stock New Englanders) were, I think, pro-intervention by late winter/early spring 1917, anyway. He appeared before the draft board on June 5, 1918, by now age 21; lacking any exemptions, he was soon called up. Following training, he was stationed at Camp Devens, Massachusetts, where he spent the few months of his service until the armistice, and probably beyond. He was assigned to the Depot Brigade, which was the unit in charge of running the base. There were at least seventeen of these kinds of new bases throughout the USA, as described here. So Earle Hazen was one of the many U.S. troops mobilized that never went to Europe. The unit to which he was assigned was still critical for the U.S. mobilization as it was responsible for operating the large base (Camp Devens) at which a number of divisions were raised and from which many were sent to France. (1) Behind Blue Eyes. 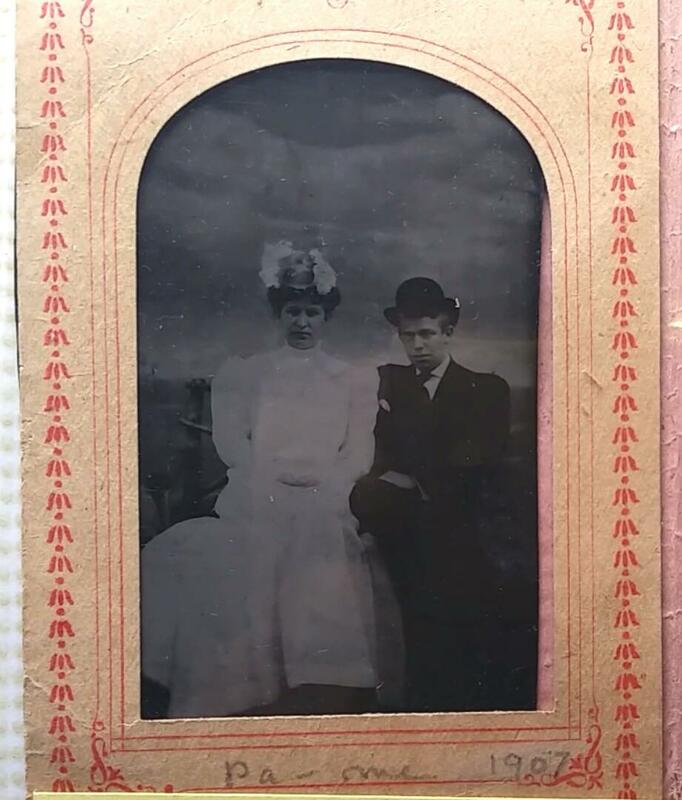 If the physical descriptions on the registration cards are to believed, one paternal great-grandfather had grey eyes, one blue; and both maternal great-grandfathers also had blue eyes. The paternal side men's eye colors are no surprise because my father also has blue eyes. The maternal side men's eye colors (both blue), if correct, are a surprise to me, because their descendants, as far as I know, all had/have darker-color eyes. This implies, according to the laws of inheritance genetics, that Walter Kosswig and Earle Hazen's wives were likely relatively dark-eyed. Not that there's anything wrong with that. (2) Handwriting analysis. I am not sure who actually filled out these cards. It probably varied from place to place, the whole system being so new. 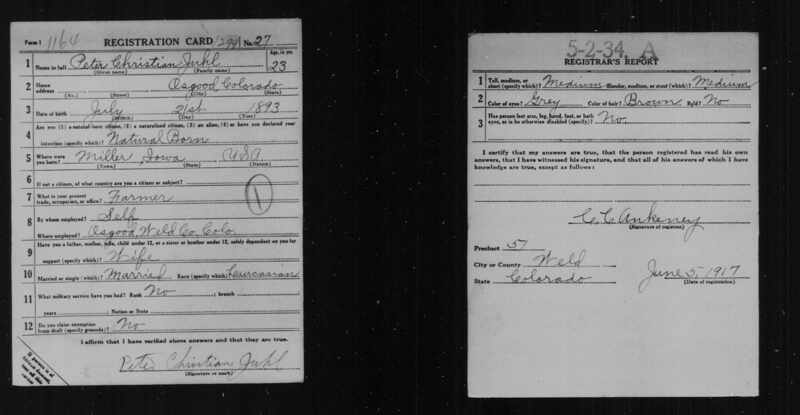 In the case of these four cards, they seem likely to have been filled out by the officials (registrars) following in-person interviews with the registering men, after which they were signed by the men (the instruction is, after all, to "verify the above answers"). The handwriting on Peter C.'s card is easiest to read, but it seems impossible that he filled it out himself: Is anyone's signature that divergent from their regular writing? The main contents of the card are also similar to the registrar's signature, so I think he must have done it. Another clue is that Walter Kosswig's card originally has "Single," which is scratched out and replaced with "Married." He would not have forgotten he was married, but a registrar might have messed it up absent-mindedly. I notice that Walter's signature, anyway, has a decided rightward slant. "If your writing slants to the right: You are open to the world around you and like to socialize with other people" (some website). Earle Hazen's looks most plausibly his own handwriting. All four cards have what I would consider very graceful cursive handwriting, characteristic of the time, the ability to write and even read which is now in the process of being lost. (3) Clues to Personality. I note that Peter C. has a "No" response for the question on whether he, the registrant, claims any exemptions; if the registrar was the one filling out the form, Peter could have easily pressed him to include a note on his exemptions (for his wife, or his status as farmer), but he did not. His wife is asserted to be a dependent (line 9), and then he says he claims no exemptions (line 12). Why did he not (legitimately) claim an exemption? He must have felt that to claim something like an exemption for a social responsibility, as this was, would be dishonorable, would be asking for an unfair advantage over others. Meanwhile, on the same day, two thousand miles to the east, Walter Kosswig has no problem claiming exemption, but saves face by starting his exemption with the word "only" ("Only on ground of dependent," that is, I'd really do it and all but I have theses chores to do...). A few lines earlier he had spilled over onto the second line explaining how many dependents he had ("wife and two children and mother in part"). And that's the end of this one. It was fun finding these draft registration cards and thinking more about them. I've written this out of my own interest and to collect thoughts on this, but I hope that others, somewhere, someday, get something from this. Thanks, people of the future (or present), for reading.